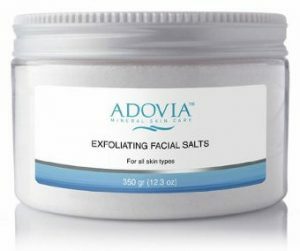 I found out about ADOVIA Exfoliating Facial Dead Sea Salts and decided to write this review while I was doing a review about Dead Sea Mud Masks which are good to be used as natural exfoliators helping your skin to be clear, away from blackheads as well as other blemishes, but also to become more elastic and glowing. So, apart from the Dead Sea mud, which is a well known for its benefits to the skin ingredient, here we have to do with Dead Sea Salts. These salts work very well for giving you a natural microdermabrasion exfoliating treatment at home that is mostly suitable for oily or acne prone types of skin. They are finely ground to be used on face but still they might be a bit harsh for sensitive or dry types of skin. To make them less harsh, you can mix them with your usual cleanser, a gentle soap´s lather, your facial mask or even a natural carrier oil like almond oil, coconut oil, jojoba oil or any other. Contains a large concentration of minerals. Adovia Mineral Skin care is a company that specializes in both skin and hair care products that are made from Dead Sea Mud and Dead Sea Salt. They have been creating good quality products for ten years successfully. So, let´s see specifically what their claims for this product are. These natural face salts remove dead skin cells and get rid of bacteria and excess oil, leaving your face thoroughly cleansed, smooth, radiant and refreshed. They also firm the complexion and by stimulating the face skin circulation, they tighten its pores. For an easy use, just apply the natural salts to a wet face that has been cleansed before and massage gently. Then, rinse off with water that is warm. Follow with a good moisturizing cream or, for me, a natural face conditioning oil like Rosehip Oil would work wonderfully. If you want to minimize the abrasive effect of the grains, you can first apply a gentle cleanser on your face and then massage the salts on your skin or mix them into your mask or natural oil and then apply the mixture on your face. What do the Adovia Facial Dead Sea Salts Reviews Say? By checking upon user reviews, there was something in common in some people´s reviews, and that was the fact that when people bought it, they thought they would get a product that is more like a lotion or like salts mixed with oil which was not the case since this product is only about salts like its title clearly states. Are Facial Dead Sea Salts for Everybody´s skin? Still, there were users who liked the fact that this product contains only salts and not salts mixed with some type of natural oil. While most people like the abrasive feeling that this type of salts offer, few others find the grains a bit too scratchy for their face. There are also some others who like using it on their body and in areas that they feel they really get a smooth feeling and toning effect after use such as hands and arms. The neck is another area that it can be used but I would suggest very gentle massaging since the skin of this area is very delicate. Another useful result that some people have clearly experienced with these pure natural salts is that they can be used topically on blemishes to help them heal and prevent acne. Overall, users are satisfied with the exfoliating results and the effectiveness in cleansing their skin thoroughly. One user mentioned a tingly feeling during her first time of use but after that everything was fine. Another user recommended that you should be careful when opening the jar because the content is filled to the top. After reviewing Adovia Exfoliating Facial Dead Sea Salts, I would say that this is a good quality natural product which works fine for exfoliating and making the skin smoother and more toned. The fact that it does not contain preservatives or any other additives makes it a good choice for natural skincare fans together with the fact that it contains a lot of minerals which help the skin be healthy. My only concern, though, is that people with sensitive skin should be aware about the fact that the grains might be a bit harsher on their skin than what they would like or need. Still, massaging the salts gently on your skin after mixing it with some natural oil, a cleanser or a mask can help you get a less abrasive result.